There are two varieties of Flower Tiles depending upon the Mah Jong set. The designs on these tiles may be confusing, as well as very ornate, giving the engraver the greatest opportunity to show off his skills. 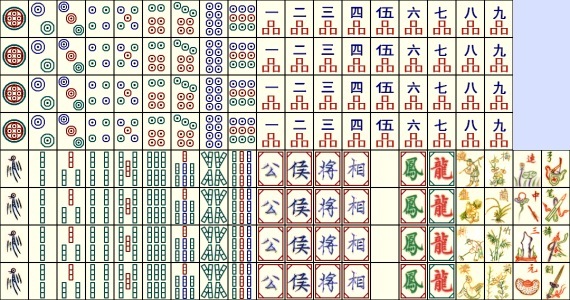 Counters are used in payment to the winner of each round of Mah Jong. Four denominations are normally used nd valued at 500 points, 100 points, 10 points and 2 points. Each player i given a total value of 2,000 points to play with. The practice of rounding the scores off to the nearest of ten is usually used, but not totally recommended. The naming of these counters reflects the Harmony which is supposed to unite Heaven, Earth and Man in Chinese cosmology. Two small dice are included in each set and, sometimes, one spare set. The Chinese dice have the 1 and the 4 colours in red ... and the 2,3,5 and 6 coloured in black. The majority of Mah Jong sets include four plain tiles to be used when any tiles are lost, mislaid or damaged. These tiles can be engraved and coloured as the replacements. It is a good idea to alternate these plain tiles with the White Dragon tiles so that they can blend 'age-wise' along with the balance of the set. In some sets there are Joker Tiles - sometimes engraved with a horse or a rabbit. These are used to replace the 2 of Bamboo when playing a Goulash. In sets where no jokers are included, the 2 of Bamboo may be used as the 'wild' tile. The box is placed with the East Wind and West Wind dice within the box indicating which Wind of the Round is being played. Racks are not usually supplied with a set. However, some players find them convenient for holding the tiles and for building the walls before each round.